Intended for the classroom teacher, this handy book provides specific guidance, strategies, and tools for helping struggling students, grades 4 and up, catch up with their peers in literacy. The thrust is intervention – specifically, utilizing word study with its hands-on, assessable approach to aid students struggling with the vocabulary, fluency, and comprehension load of middle and secondary classrooms. This text will help you determine student needs, provide you with the strategies to guide each student toward success in content area comprehension, and even outline ideas for fitting these strategies into your crowded schedule. You’ll have the tools you need to help your students acquire the literacy skills they need to meet the ever-increasing demands of school life. Your chapters deal with the realities of a teacher’s day and demonstrate ways that teachers can incorporate skills and strategies across the content areas. I really learned a great deal from this copy. You have so many excellent ideas that will help teachers. I see the goal as an attempt to answer the needs of knowledgeable teachers and reading specialists working with adolescents in school settings. I think the authors have struck a near perfect rendition of the scope needed to address their goals. The major goal of this book is to provide specific strategies to improve the reading skills of struggling older readers. I believe that the authors have fully accomplished this goal. They have also successfully provided many great suggestions and activities to help content area teachers make content reading and comprehension more accessible. The authors' in-depth description of classroom management and organization should go a long way toward alleviating fears that teachers have of implementing word study in the intermediate or secondary grades. Teachers of any subject area can immediately begin using these strategies in their classrooms and feel confident doing so. 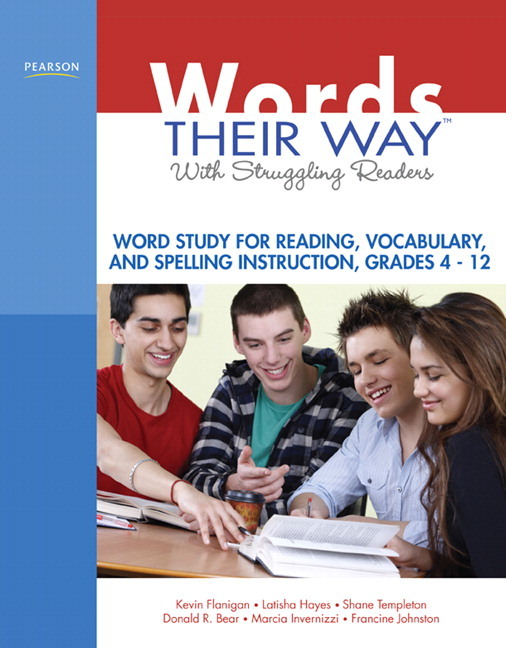 Every middle or high school teacher should have a copy of Words Their Way® with Struggling Adolescent Readers in their classroom regardless of the subject being taught. Well written, lots of good teaching examples, some wonderful insights about vocabulary that will stick with teachers. The teaching activities are excellent and teachers will find them highly useful. I very much appreciated having the great assessment tools. The goal settng guide is also excellent. Teachers won't get this information elsewhere. The authors have created a comprehensive text for teaching struggling readers, English Language Learners, and even most all of our students how to learn vocabulary and word study. There is a definite need for this kind of instruction, and these authors do quite well in presenting the material for pre-service and practicing teachers. · Focuses on specific needs of older struggling readers in upper elementary, middle, and high schools. · Uses a two-pronged approach to word knowledge instruction: (1) orthographic knowledge (phonics, spelling, decoding) and (2) vocabulary knowledge. · Highlights vocabulary activities to address needs across the content areas: math, science, social studies, and English. Word Study with Struggling Older Readers…Discusses three main areas that impact reading performance: orthographic knowledge, vocabulary and comprehension knowledge, and motivation/engagement. The Assessment of Orthographic Development and Vocabulary Knowledge: Outlines orthographic and vocabulary assessments that get teachers started in developmentally targeted word study instruction. Word Study Instruction and Organization: Principles and Practices…Describes how to organize and manage individual as well as small and whole group activities (e.g., word sorting, writing applications, etc.) to deliver effective developmental word study instruction. Word Study with Older Struggling Readers in the Within Word Pattern Stage…Highlights effective instructional practices that promote phonics, spelling, and decoding knowledge. Orthographic features covered: vowel and complex consonant patterns. Word Study with Older Struggling Readers in the Syllables and Affixes Stage… Highlights effective instructional practices that promote phonics, spelling, and decoding knowledge. Orthographic features covered: syllable patterns as well as accented and unaccented syllables. Generative Vocabulary Instruction…Highlights effective instructional practices that promote vocabulary knowledge. Teaches students how to tap into the power of Latin and Greek derived prefixes, suffixes, and roots to exponentially increase vocabulary knowledge. Kevin R. Flanigan has taught as both a classroom teacher in the upper elementary/middle grades and as a reading specialist/literacy coach working with kindergartners through middle-grades students. He has authored or co-authored articles in The Reading Teacher, The Journal of Adolescent and Adult Literacy, and the Journal of Literacy Research and has presented frequently at regional, national, and international conferences. Donald R. Bear is director of the E. L. Cord Foundation Center for Learning and Literacy where he and preservice, Master’s and doctoral students teach and assess children who struggle to learn to read and write. Donald is a professor in the Department of Educational Specialties in the College of Education at the University of Nevada, Reno. Donald has been a classroom teacher and he researches and writes about literacy development and instruction. He is an author of numerous articles, book chapters, and books, including Words Their Way®, Words Their Way® with English Learners, and Vocabulary Their Way. Marcia Invernizzi is a professor of reading education at the Curry School of Education at the University of Virginia. Marcia is also the director of the McGuffey Reading Center, where she teaches the clinical practica in reading diagnosis and remedial reading. Formerly an English and reading teacher, she works with Book Buddies, Virginia's Early Intervention Reading Initiative (EIRI), and Phonological Awareness Literacy Screening (PALS).